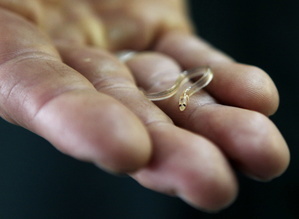 The lucrative fishery for tiny glass eels, or elvers, has led to a clash between the state and Indian tribes over sovereignty and federal fishing regulations. Officials with an American Indian tribe in Maine are resisting an initiative to impose the same restrictions on all elver fishermen, saying a cap on individual catches would force them to abandon tradition by limiting who has access to natural resources. Members of the Passamaquoddy tribe say a bill to be considered by the House today is against their tribal values because it could prevent some of its fishermen from gaining access to the fishery. Under the bill, elver fishermen would be subject to the same individual catch limits as other Maine fishermen. But the Passamaquoddy contend the tribe has made numerous other concessions, limiting itself to just one type of gear and agreeing to a decrease in its overall share of the elver harvest. Passamaquoddy officials say choosing who can fish is cultural, not just a matter of conservation. “The issue here is who gets to decide tribal culture,” said Fred Moore, the fisheries specialist with the Passamaquoddy who drafted its elver management plan. He said the tribe supported the bill as part of the state’s conservation plan. The tribe, he said, enacted its own conservation measures years ago, including weekly catch reports from its elver fishermen. Elvers are baby eels that have ballooned in value in recent years to become the second most valuable fishery in the state behind lobster. As the state considers the bill, Moore said the tribe would continue to press the state to honor an earlier agreement. That agreement was the result of months of negotiations and had the approval of the Atlantic States Marine Fisheries Commission but state officials abandoned it after the attorney general voiced concern it would not be constitutional to apply two sets of rules in the same fishery. That move also shed doubt on the authority of tribes in regulating marine resources. The sponsor of the bill says the tribe’s position is understandable. “The tribes have a valid point,” said Rep. Walter Kumiega, D-Deer Isle, who also co-chairs the joint Standing Committee on Marine Resources. “They have said that they have been treated differently over the years many times and maybe we should take that” into consideration, he said. Still, Kumiega said, lawmakers would continue to take into account the concerns raised by the attorney general. Both state and tribal officials have said they would like to avoid the types of disputes that arose last year when the commissioner of the Department of Marine Resource invalidated all Passamaquoddy elver fishing licenses. The commissioner has said he would take similar steps this year if the tribe did not follow state law. This entry was posted in Environment, News and tagged American Indian Tribe, Atlantic States Marine Fisheries Commission, elver fishermen, elver management, Maine, Maine fishermen, Passamaquoddy Tribe, Rep. Walter Kumiega, Staning Committe on Marine Resources, tribal culture, tribal fishermen by admin. Bookmark the permalink.